Tony Leung Chiu-Wai on the make in Flowers of Shanghai. The Skinny: From Taiwanese director Hou Hsiao-Hsien comes this critically lauded, yet interminably dull tale about the inner workings of a Shanghai brothel. Flowers of Shanghai may be beautiful to look at, but honestly, what's all the fuss? Review by Calvin McMillin: If there's one thing that irks me when I hear people talk about movies, it's when someone quickly dismisses a film as "boring." Sure, boring movies do exist, but to me, such criticism smacks of a potential impatience and lack of sophistication on the part of the viewer. So maybe that's why I'm a little hesitant to launch into my own harsh critique of the highly acclaimed film Flowers of Shanghai because, quite frankly, I found the whole affair pretty damn tedious myself. In all sincerity, I was surprised that I came to that conclusion, considering that the movie was virtually earmarked for success from the get-go, boasting an excellent director in Hou Hsiao-Hsien, a winning cast (including the likes of Tony Leung, Michelle Reis, and Carina Lau), and an interesting locale to boot, the exotic "flower houses" of 19th century Shanghai. But somewhere along the journey, things went awry. 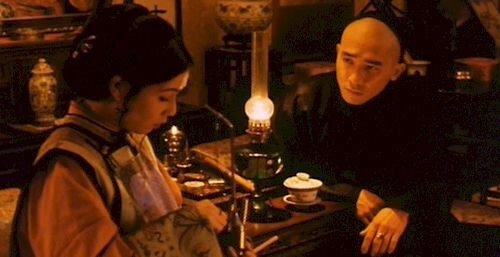 Based on a novel by Han Zuyin, the film uses a series of vignettes to intercut two stories within the flower houses of Shanghai. The first story involves Wang (Tony Leung Chiu-Wai), a gentleman caller caught between two womenhis longtime lover Crimson (Michiko Hada) and new flame Jasmin (Vicky Wei). The second plot focuses on Emerald (Michelle Reis), a haughty yet popular call girl looking to buy her way to freedom. The material for a compelling film seems to be right there in front of us, but somehow the movie stalls, so much so, that I'm at somewhat of a loss to explain the positive critical buzz surrounding this film. Yes, it does look good, but nice lighting alone doesn't make a movie worth recommending. I mean, is it really "one of the ten best films of the year" or the "cinematic highpoint of the nineties" as the DVD box art proudly proclaims? All reviewers, myself included, can be prone to hyperbole, but this is ridiculous. Perhaps these critics (all American by the way) are suffering from a slight case of "foreign movie syndrome," that is: if the movie's not in English, it must be good. Here's a telling example of my frustration. More than halfway through the film, Tony Leung's character, after more than an hour of stoic indifference, finally loses control of himself, smashing anything and everything around him. At that moment, the narrative really begins to heat up, but to my complete disappointment, it fizzles almost as soon as it began. That momentary spark is never really capitalized upon, and the movie resumes its plodding pace once more.